FEATURES PHOTOGRAPHY BY BARBARA KRAFT WINTER 2017/2018 14 26 史提芬永利：製造奇蹟的人 一位終生難忘的摯友在永利拉斯維 加斯擁有了一處永遠屬於他的地方， 史提芬永利先生向我們講述他這位 人生導師Charl ie Meyerson的故事。 By Andrea Bennett 26 STEVE WYNN: MAGIC MAN A never-forgotten friend gets his own permanent place at Wynn Las Vegas, and Steve Wynn tells the story of his mentor, Charlie Meyerson. By Andrea Bennett 32 普洱的魔法 普洱茶是世界上最著名的茗茶品種之 一，香氣微妙而豐富，帶著些許泥土 的芬芳。在永利宮，由專業侍茶師沖 泡出與粵式美饌和諧相配的陳年普洱 茶，可與最優質的葡萄酒相媲美。 By Kate Springer 32 PU'ER MAGIC Earthy and complex, Pu'er is among the world's most celebrated tea varieties. At Wing Lei Palace, a dedicated tea sommelier brews vintage Pu'er that pairs perfectly with Cantonese cuisine—and rivals the best wines. By Kate Springer 38 精彩名店 現已開業 永利拉斯維加斯的Esplanade名 店街裡有多間新店精彩開業，無 與倫比的奢華體驗已經來臨。 By Rachel Felder and Mark Ellwood 38 NOW OPEN The debut of dazzling new stores on the Esplanade at Wynn Las Vegas sig nals the unparalleled luxur y to come. By Rachel Felder and Mark Ellwood 46 最珍貴的味覺獎賞 世界上最珍貴的牛肉，甚至比神戶認 證的牛肉還要罕有，只能在日本一個常 年積雪的海島以及位於永利拉斯維加 斯的「泓」日本料理的菜單裡找到。 By Larry Olmsted 46 THE RAREST PRIZE Some of the most cherished beef in the world—even scarcer than certified Kobe—can be found on a single snowy island in Japan—and on the menu at Mizumi at Wynn Las Vegas. 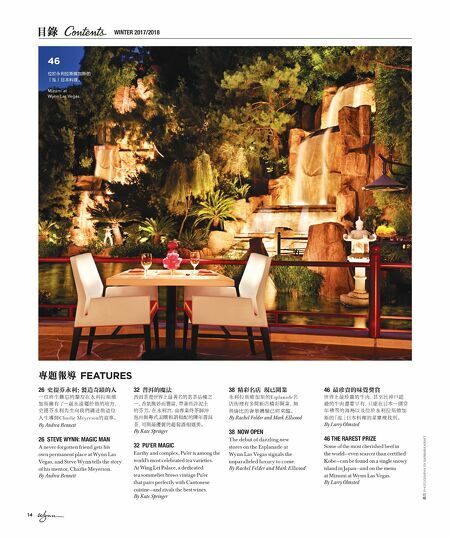 By Larry Olmsted 46 位於永利拉斯維加斯的 「泓」日本料理。 Mizumi at Wynn Las Vegas.